As you can imagine, I was startled by this gloomy message about the so-called fate of Christians in the Islamic tradition. The Qur’anic passage sent to me implies that Christians are abhorrent people in the eyes of Prophet Muhammad and that the Prophet condemns Christians to eternal hellfire because they identify with a faith other than Islam. Would Muhammad agree with my Twitter follower? Does the Prophet think that Christians are losers who have no chance of making it to heaven? To shed light on these questions, I turn to Islamic scripture and its verses about Christianity. The Qur’an refers to Christians and Jews as “People of the Book,” or people who have received and believed in earlier revelations from God’s prophets. As such, Muslims and Christians believe in God, the Day of Judgment, and doing good deeds, hence why the Qur’an (3:114) describes Christians as “among the righteous.” The Qur’an (5:82) even goes as far as stating that the people whose faith is closest to the beliefs of Muslims are “those who say, ‘We are Christians.’” Far from labeling them as losers, Prophet Muhammad revered Christians because of their monotheistic beliefs. He considered them to be more like close cousins and not adversaries. The Prophet’s admiration for Christianity is also clear in a covenant he agreed to with Christian monks at Mount Sinai in Egypt. Muhammad guaranteed that their leaders would stay in power and that Christian pilgrims would never be hindered from worshiping during their pilgrimages around the Arabian Peninsula. If Prophet Muhammad thought that Christians were fools, which my Twitter follower insinuated, he would have never commanded Muslims to protect churches at Mount Sinai or aid Christians in restoring churches that had fallen into disrepair. 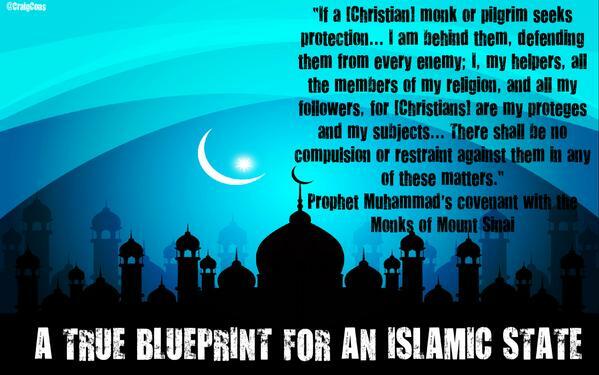 The Prophet’s covenant with the monks in Egypt also warned that Muslims who disrespect Christians and disobey his commands make “a mockery of Islam.” In Muhammad’s eyes, these disobedient Muslims were the true “losers” in the eyes of God. 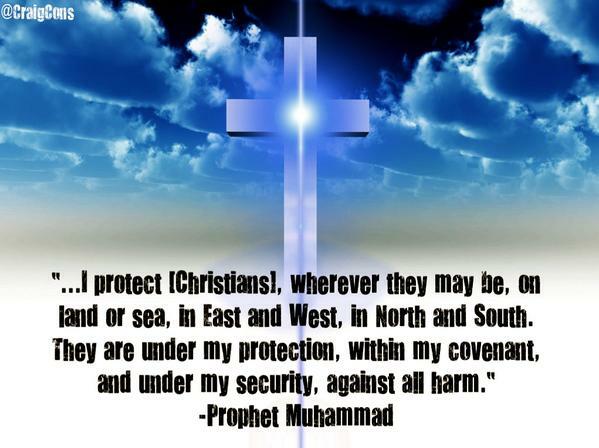 The idea that Prophet Muhammad was “anti-Christian” is easily dispelled by turning to his covenant with the Christians of Persia. In this agreement, the Prophet made it clear that he had no interest in converting Persians to Islam. He proclaimed: “No Christian shall be brought by force to confess Islam.” Instead of aggressively pursuing Christians to accept the Muslim faith, Muhammad envisaged Muslims showing Christians “the arm of mercy and kindness” and protecting them from “the exactions of oppressors.” If he thought that Christians were losers, would the Prophet have gone to such lengths to support and care for their well-being? It is also worth considering what Prophet Muhammad thought about Muslims who call Christians cruel names or condemn them to the hellfire. Muhammad explicitly laid out the consequences of disrespecting Christians: “He who wrongs a [Christian] will have myself as his accuser on the Day of Judgment” (Al-Bukhari). Christians, on the other hand, “will have their reward with their Lord. They will feel no fear and will know no sorrow” (Qur’an 2:62). The Prophet made it clear: Muslims are not to judge others and Christians will have their reward of heaven if they show good faith and piety. As ever, Dr Considine cherry picks benign sounding verses while ignoring the very unbenign verses in the Koran about Christians. Apart from 3:85, about which his correspondent is right, here is a sprinkling of others to take account of: 2:120, 4:47, 5:51, 5:72, 9:29 and 98:6. As for 3:64, this was exactly Allah’s gripe with the Christians – that in his view they did not worship one god but a trinity (5:73) which, in a lapse of omniscience, he thought consisted of God, Jesus and Mary (5:116). It a conversation between God n Jesus in Judgement” And [beware the Day] when God will say, “O Jesus, Son of Mary, did you say to the people, ‘Take me and my mother ( Mary) as deities besides God ? '” He will say, “Exalted are You! It was not for me to say that to which I have no right. If I had said it, You would have known it. You know what is within myself, and I do not know what is within Yourself. Indeed, it is You who is Knower of the unseen. I said not to them except what You commanded me – to worship God , my Lord and your Lord. And I was a witness over them as long as I was among them; but when You took me up (God), You were the Observer over them, and You are, over all things, Witness. If You should punish them – indeed they are Your servants; but if You forgive them – indeed it is You who is the Exalted in Might, the Wise” (5:118 AL-MA’IDAH). It’s absolutely irrelevant what Mythical Mo might have thunk. The facts are that a sizable proportion of his followers are performing genocide on Christians, Hindus and Buddhists, and have been doing so for 1400 years. You can call them not real Muslims all you like but they find plenty of (out of context if you like too) instructions to commit this genocide from the Koran, Hadiths etc. I hesitate to be so direct, but quite honestly, anyone still stating Islam to be peaceful must be brainwashed, brain-dead or bribed. Your venom is spilling! Calling names and putting others down: “Mythical……..”! You were just dying to call names! Certainly; Do not hesitate to be direct and quite honestly, do Keep burning in the fire you have lit in your own heart. “And whosever desires a religion other than Islam, it shall not be accepted from him, and in the hereafter he shall be one of the losers” (3:85). This verse is translated in English from Arabic but the one word “ISLAM” in it has been left untranslated. Translate it and then see that it is not causing any problem to the follower of any other religion than Islam! “Islam”, if translated in English reads: SURRENDER ONE SELF TO GOD.